Ottawa – New technologies are shrinking our ability to protect our anonymity – a trend being reinforced by laws around the world, according to a new study by leading scholars from Canada, the United States, the United Kingdom, Netherlands and Italy. 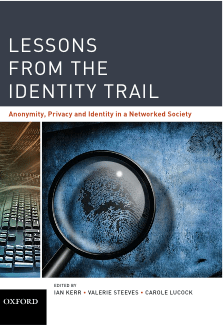 The authors of the new book, Lessons from the Identity Trail: Anonymity, Privacy and Identity in a Networked Society, were part of a collaborative research initiative, On the Identity Trail, which studied the impact of technology on privacy, identity and anonymity. This entry was posted on Wednesday, April 8th, 2009 at 9:36 am and is filed under National News, Research Studies. You can follow any responses to this entry through the RSS 2.0 feed. You can leave a response, or trackback from your own site.